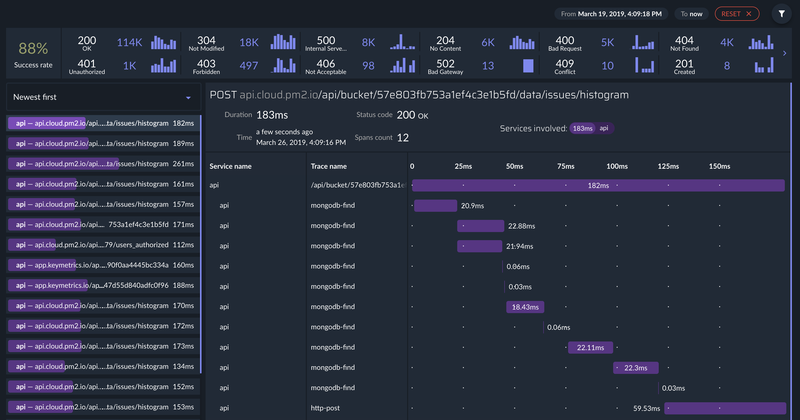 The Distributed Tracing allows to captures and propagates distributed traces through your system, allowing you to visualize how customer requests flow across services, rapidly perform deep root cause analysis, and better analyze latency across a highly distributed set of services. If you want to customize the configuration, you can install @pm2/io module in your package.json. See bellow. The custom tracing API can be used to create custom trace spans. A span is a particular unit of work within a trace, such as an RPC request. Spans may be nested; the outermost span is called a root span, even if there are no nested child spans. Root spans typically correspond to incoming requests, while child spans typically correspond to outgoing requests, or other work that is triggered in response to incoming requests. To create a span in a trace, we used the Tracer to start a new span (4). A span must be closed in order to mark the end of the span. // so that'll be the parent span, and this will be a child span. * Enabled the distributed tracing feature. Above, you can see a trace with various spans. In order to respond to /messages, several other internal requests are made. Firstly, we check if the user is authenticated. Next we check if their messages were cached. Since their message wasn’t cached, that’s a cache miss and we then fetch their content from MySQL, cache it and then provide the response containing their messages. You must at least use node 6.0.0. Of course in any cases, we advise to use the latest version since they improved the suppot for tracing a lot recently. We agree and we are open to any feedback for visualization or amelioration for the issue, please use the feedback buttom at the top-right of the application.